A dash more authentic--or, at least, more subtle--than its Hollywood spawning and Taylor Hackford's come-on-strong take on [Ray] Charles would seem to predict. 135 min. 20th Century Fox. Director: James Mangold. Cast: Joaquin Phoenix, Reese Witherspoon, Ginnifer Goodwin, Robert Patrick, Dallas Roberts. 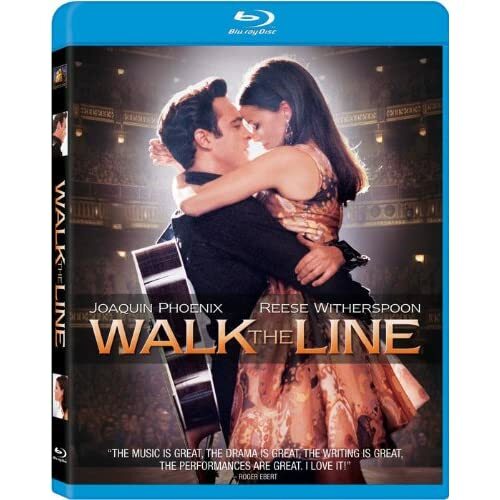 Clearly, Walk the Line was a no-brainer priority for 20th Century Fox after the 2003 death of Johnny Cash and June Carter Cash, and the 2004 success of Oscar-friendly Ray Charles biopic Ray. In small ways, though, writer-director James Mangold and co-screenwriter Gill Dennis (working from Cash's autobiographies Man in Black and Cash: The Autobiography) make the story of country-folk star Johnny Cash a dash more authentic—or, at least, more subtle—than its Hollywood spawning and Taylor Hackford's come-on-strong take on Charles would seem to predict. Yes, in drilling for motivational oil, Mangold leans on the early childhood death of Cash's brother, just as Ray did with its twin trauma. Cash also has daddy issues: his father (Robert Patrick, keeping it real) considers him a no-count and transfers guilt upon him. 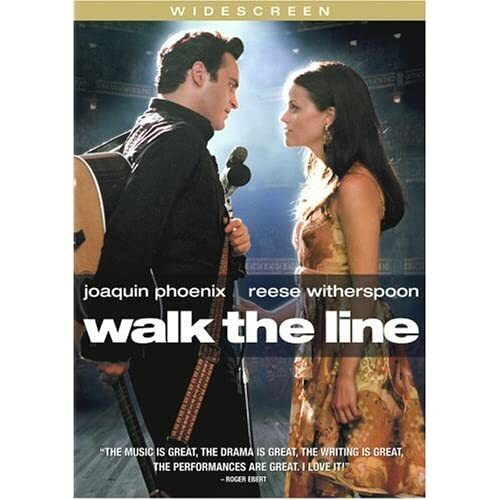 And yes, Walk the Line perpetuates the silly suggestion that a hit song can be written, off-handedly, in the course of a clumsily scripted conversation: June incongruously huffs at Johnny, "You can't walk no line" and voilà! But in the middle of this lumbering biopic (Mangold could have taken a cue from Cash's "steady as a freight train" drive), Cash has an unspoken epiphany that, while hardly profound, provides a breath of fresh air not found in Hackford's vacuum-packed Ray. After freaking out on first wife Vivian (Ginnifer Goodwin), Cash (Joaquin Phoenix) sits alone in the horrible knowledge that he has much of his father in him--predilections to abuse others and himself, by way of illicit substances. In this moment, at least, Mangold resists flashing back to the childhood well of pain and lets Phoenix do his job. Better yet, the filmmakers bring the paternal conflict to an admirable détente that ends the film on a grace note. Phoenix does his job very well, and it's difficult to imagine anyone past or present even coming close (perhaps Robert Blake in his prime). The star's sultry, tortured magnetism (which gossips insist he takes with him everywhere, even backstage at Oprah) suit Cash. When Sam Phillips (Dallas Roberts) harangues him to play something real, Cash begins galumphing through "Folsom Prison Blues." Something clicks in, and like a man possessed, Cash takes the song all the way home (watch how Phoenix, as he sings, turns in wonder to his bandmates—he's as surprised as they are that he had this in him). The scene of Cash's artistic breakthrough may be a load of hooey, but it's an effective dramatization of a musician latching onto his style. In these scenes, Phoenix strikes a good balance between moony and brusque, but it's Witherspoon who does the heavy lifting. Carrying the romantic plot, the film's heart and soul, Witherspoon portrays Carter as a woman who sees the best in Cash, sees Cash can bring out the best in her, but isn't at all sure she can handle the baggage of adultery and drug addiction. The story of Cash as musical artist gets short shrift--according to conventional wisdom, there's not much drama in acts of creativity--but Mangold, Dennis, and Phoenix conspire to recreate Cash's attitude, a tension of Christian roots and devil-may-care style. Twice, the Man in Black is told, "Looks like you're going to a funeral." "Maybe I am," he responds. Modern fans, who listened to the physically declining Cash ache powerfully through still potent music, will recognize someone keenly aware of his own mortality, a man who determined, once upon a time, to stop squandering his hours on the wrong woman and the wrong high. The Blu-ray debut of Walk the Line features a video transfer that's a beaut: rich in color, deep in blacks and dimension, and sharply detailed. A great deal of attention went into the film's photography, and this disc captures every nuance. The DTS-HD Master Audio 5.1 mix is likewise fantastic, especially in the muscular presentation of the film's many musical sequences; the immersive effect is potent, whether by music or environmental effects. The extensive extras kick off with a fascinating commentary by co-writer and director James Mangold, whose comments cover not only the production but his own experiences meeting Cash. "More Man in Black - Deleted Scenes" (23:13, HD) comprises ten clips thoughtfully presented in HD and with optional commentary by Mangold. Three "Extended Musical Sequences" (5:40, HD) featuring Phoenix and Witherspoon are a blast. "Folsom, Cash & The Comeback" (11:47, SD) focuses on one of Cash's career highlights, as recalled by musician Marty Stuart, Rolling Stone contributing editor Steve Pond, musician Kris Kristofferson, Cash biographer Patrick Carr, Rolling Stone assistant managing editor Jason Fine, Country Music Hall of Fame historian Jay Orr, Folsom Prison public information officer Lt. Robert Trujillo, The Statler Brothers, and author and Cash friend Bill Miller. "Celebrating the Man in Black: The Making of Walk the Line" (21:38, SD) provides an overview including interviews with musician/friend Willie Nelson, Stuart, Kristofferson, musician Henry Rollins, Joaquin Phoenix, Mangold, Dallas Roberts, Tennessee Two bass player Marshall Grant, Johnny & June's son John Carter Cash, Reese Witherspoon, Cash's manager Lou Robin, producer Cathy Konrad, composer/executive music producer T-Bone Burnett, Tyler Hilton, Shooter Jennings, Waylon Malloy Payne, musician/friend Merle Haggard, music producer/friend Jack Clement, musician Kid Rock, musician/friend Rodney Crowell, and musician/friend John Mellencamp. "Ring of Fire: The Passion of Johnny & June" (11:29, SD) reflects on the relationship at the heart of the film. Participants include The Statler Brothers, Fine, Carr, Orr, Pond, Stuart, author & Cash friend Bill Miller, author/historian Alanna Nash, Joaquin Phoenix, Kris Kristofferson, and Cash. Last up is the "Theatrical Trailer" (1:49, HD). The disc's only real flaw is the lack of the film's Extended Cut, currently available on a region-free European disc that includes a few more extras. An ideal set would provide both cuts via seamless branching, as well as all of the extras, but casual fans will be plenty happy with this disc in the meantime. All site content © 2000-2019 Peter Canavese. Page generated at 04/21/2019 02:43:37AM.